Orders placed today will ship the week of 4/29/2019. Gift certificates will ship within 1 business day. If you want a later ship date, please indicate the date you would prefer in your order comments. Orders are shipped Monday, Tuesday and Wednesday. Holidays and uncooperative weather will sometimes delay shipping. We do not ship in August or mid-December through January, except by special arrangement. We do not ship to Hawaii or out of the country. Sorry! If you would like to add plants to your existing order, please place a new order for the plants you wish to add and tell us in the order comments that you would like us to combine your orders. 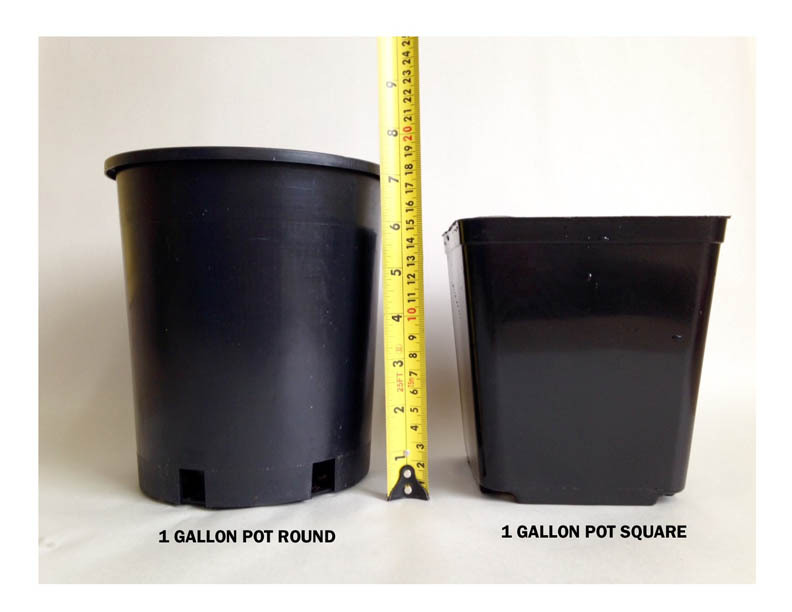 This will reserve your plant for you and help you save some in shipping costs. We do need 1 business day notice in order to combine your orders and even more advance notice is greatly appreciated. We accept VISA, Master Card, Discover, PayPal, and checks by mail. Your credit card is charged upon placing your order, which stakes your claim on your plants. If we are unable to fill your order completely, you will be refunded. Shipping costs are based on weight and volume PLUS a base shipping charge. We ship by USPS and FedEx. If you have a preference, please let us know. Shipping costs are higher than we like, but please know we do not make money on shipping fees. 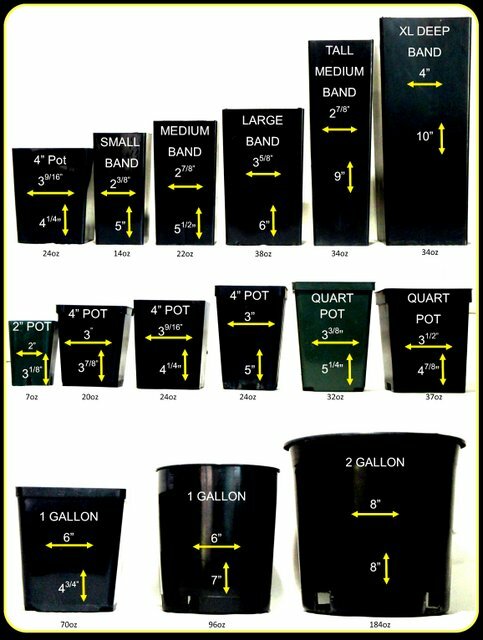 We normally ship your plants in nursery pots and wrapped carefully in an eco-friendly material.Our plants come in a variety of pot sizes. Dormant bulbs or rhizomes may be sent in soil-free shavings, which reduces shipping weight. If your plants arrive dead or seriously damaged, please notify us within 5 business days. We will do our best to remedy the situation. Plants shipped by ground are NOT guaranteed but plants shipped express are. Orders cancelled more than 48 hours after being placed will be charged a $40 restocking fee. 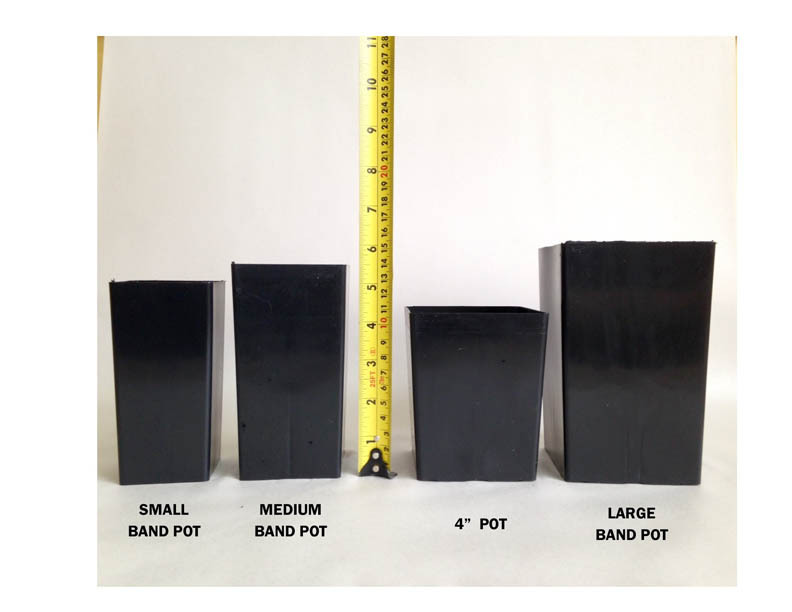 Small Band Pot: 2.25" x 2.25" x 5"
Medium Band Pot: 2.5" x 2.5" x 5.5"
4" Pot: 3.5" x 3.5" x 4.25"
Large Band Pot: 3.5" x 3.5" x 6"
1 Gallon: 5.5" x 5.5" x 6" or round 6.5" x 7"